(TibetanReview.net, Dec03, 2017) – Amid groups of Red Flag-waving Chinese supporters, a small but determined band of Tibet advocates on Nov 26 displayed Tibetan flags and shouted ‘Free Tibet’ slogans as Chinese premier Li Keqiang arrived in Budapest, capital of Hungary, for a regional summit. Heavy handed police action to deter the protesters was later criticized in the country’s parliament. The route of Li Keqiang’s motorcade was closed to traffic in Budapest, but numerous supporters were seen near the route waving Chinese flags, reported budapestbeacon.com Nov 27. But police action was restricted to Tibet supporters who were manhandled by them. 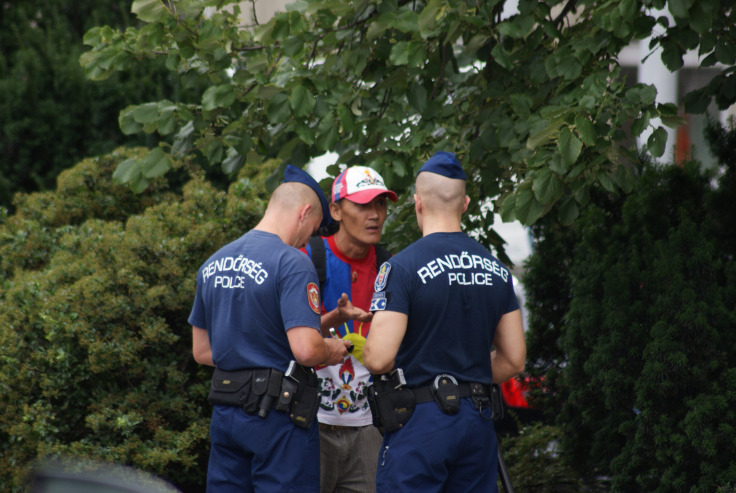 Tibor Hendrey, president of the Tibet Support Association Sambhala Tibet Center, was physically restrained by police and had the flag removed from his hands, after which he began to yell “Free Tibet!” at the motorcade, the report said. Only this summer, Hendrey had received court-ordered compensation from the Budapest police for a similar crackdown in 2012. At that time he was arrested for waving a Tibetan flag at Li Keqiang’s motorcade when the latter was China’s Senior Vice Premier. Hungary’s highest court, the Curia, ruled this summer that the police had violated Hendrey’s right to express his opinion, and ordered the Budapest Police to pay him HUF 500,000 (USD 1,900) with interest as well as legal fees, the report said. On Nov 28, Bernadett Szel, from the LMP, addressed Hungary’s parliament, holding a Tibetan flag, criticizing the government for prohibiting freedom of speech of the citizens by preventing them from demonstrating for the Tibetan issue and calling for a Free Tibet. Szel is her party’s face for election as the country’s next Prime Minister. The report also noted that Hungary’s current Minister of Human Resources, Zoltán Balog (Fidesz), himself had waved a Tibetan flag at a press conference of the Tibet Support Association and Amnesty International in 2008 during a visit by a Chinese delegation. Balog was also reported to have announced at a press conference at that time that Fidesz, then in opposition, along with other opposition parties, had submitted a resolution to the National Assembly for “the Hungarian Parliament, calling on the People’s Republic of China to uphold respect for internationally accepted human rights and for the end to the use of force” against the people of Tibet. Balog had also compared the 1956 Hungarian revolution with the Tibetan uprising of 1959. Li was in Hungary to lead the annual regional “16+1” summit between China and 16 Central and Eastern European (CEE) countries.